We’re back with another Monday Montage blog hop, our first of 2015. You can follow along the hop by clicking on the links at the bottom of each post. All of these other ladies are so talented so you won’t want to miss a thing. This was our second year to do a swap of our favorite things. We decided to do a New Year’s swap to avoid a little of the craziness around Christmas. Plus, it’s fun to extend the season a little and give a surprise gift. I had the pleasure of giving a gift to Wendy Weixler. She is pretty much the fearless leader of our little group, so I wanted to give her something good as she is very deserving. I started with a homemade card. 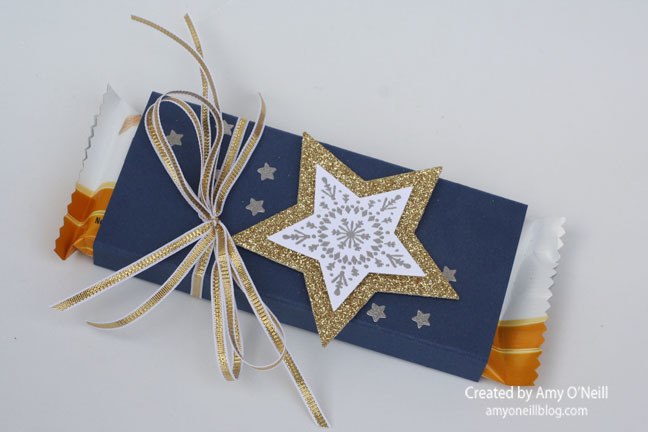 I used a little gold, silver and Night of Navy and the Many Merry Stars photopolymer set. This set came out for Christmas, but it so versatile that I plan on using it all year (birthdays, graduation, etc…). 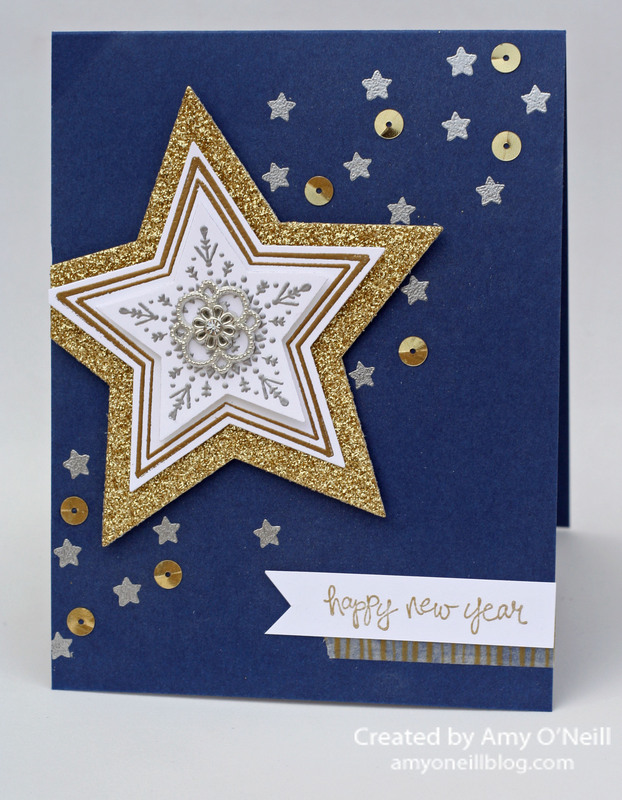 Since this is a New Year’s card, I thought it deserved lots of sparkle, so I used lots of glimmer paper, embossing and sequins. For her gift, I gave her one of my favorite books from last year, The Rosie Project. Have you read it? Our book club read it, and we all loved it. It’s a smart and quirky romantic comedy. I’ve read that they will be making a movie from the novel, and I think it would make a cute movie. I also included a little something to snack on while reading her book, a Peanut Butter Creme PowerCrunch bar. Love those things! I decorated it with the same materials I used for the card and just made a wrap to go around the bar. I feel so blessed to get to work with the ladies in this group. Not only are they are amazingly talented, but they are kind, funny, and supportive. You’re ready to hop on over to Breelin Renwick’s blog and check out her beautiful projects. She sent me some fabulous gifts, and I think she’ll be sharing that in her post. I have greatly enjoyed them. If you prefer to work your way backwards, you can venture over to Wendy Weixler’s blog where she’ll have something beautiful to share with you. Enjoy your Monday Thanks for stopping by!